I'm not really sure how we all lived before hair oils were introduced to us but it can't of been a great life for our locks! Since starting to use hair oils (mainly Argan based) at the beginning of last year I have tried a fair few and although I have my favourites I am always up for trying more! Hello - Argan Dew and your fabulous products! 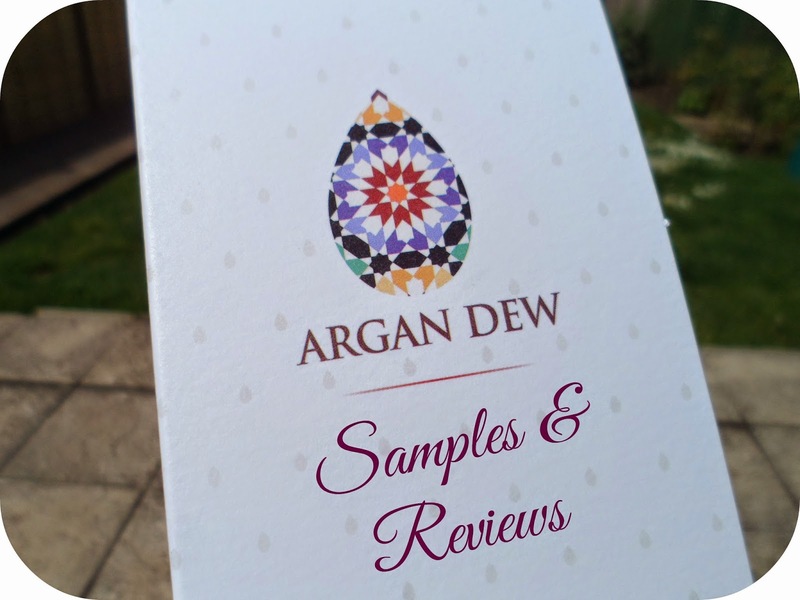 Argan Dew are a fairly new company to the UK so being one of the first people to get my hands on some samples was highly exciting! The products I have been trying out are the argan oil (*) and the replenishing hair mask (*). I have been using the Moroconnoil treatment non-stop since first trying it out last July so when that ran out of it recently I was in a right tizz that my hair would just be an uncontrollable mess - luckily Argan Dew were there for me and came to the rescue. Being such a fan of Morocannoil it was going to take alot for me to be impressed and these products didn't dissaapoint. These are fantastic and I have been so excited to blog about them! First up we'll talk about the Argan Oil. Because these are just samples that I have the oils are just in 3.5ml sachets! It doesn't sound like alot but they go a long way! I have been using this stuff every time I wash my hair. After I've towel dried my barnet I give it a good comb through and then pop this stuff from the mid-lengths to the ends. Normally about a 1p piece sized amount is enough, so these sachets last for a good few washes! The results have been fantastic, my hair has been so soft, less frizzy and it somehow actually feels longer (is that possible?). I'm actually leaning towards this stuff a bit more than my precious Morocannoil - shocker! The only thing I would mention about this argan oil is the scent, there is a slight smell of what I would describe as nappy sacks. You know those scented bags you put dirty nappys in? I swear their is a slight whiff of that going on - but it isn't awful and it didn't make my hair smell so who cares! Now onto the Replenishing Hair Mask. Again this is a sample so these are just 10ml. A hair mask is something I do probably once a week, I love having a good old pamper and giving my hair a treatment! This stuff is a pretty pearly white colour and is a creamy conditioning texture! I pop this on and leave it for around 5 minutes before rinsing it out! My hair is left feeling light, soft and silky! Even after having french plaits all day and then brushing my hair - the amount of frizz is nowhere near what it normally is! I love love love this stuff! Overall all I can say is - when are this products available in full size?! I want/need them in my life, I'm already dreading all my samples running out! Not only these 2 products either, I can't wait to try out the rest of the range too! Have you tried Argan Dew yet?! These sound so good, I'm addicted to any sort of hair oil! Love the new blog design too chick. Ooh new blog design! Very cute. These sound amazing, Argan oil makes hair feel amazing. I'd be lost without it! Cosmo Blog Awards 2014 : Best Newcomer?